Cincinnati: OT Anthony Collins, CB Brandon Ghee, DL Carlos Dunlap, RB Cedric Peerman, QB Dan LeFevour, WR Jerome Simpson, DL Jonathan Fanene, OG Reggie Stephens. Cleveland: TE Alex Smith, WR Brian Robiskie, WR Carlton Mitchell, CB Derrick Roberson, QB Jake Delhomme, RB James Davis, OT John St. Clair, OG Shawn Lauvao. 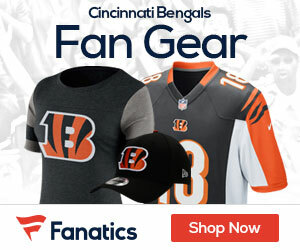 Sign up to receive our daily Bengals Gab newsletter, and keep up to date with all the latest Cincinnati Bengals news. Celebrity Seats has all the best Cincinnati Bengals Tickets, Cincinnati Reds Tickets, and Columbus Blue Jackets Tickets!